However, I couldn’t post the assignment online right away as I hadn’t given it out to my students at that point. Now I can. Although I had lots of student questions about the assignment (more than I do a ‘normal’ assignment), I could tell that this problem had the students think outside of the box more than they would have had I not given them this assignment at all. I tried to manage the student questions by starting a discussion thread on CANVAS and I jumped in at what I thought were appropriate times during the discussion. For the most part, though, what I saw were students helping each other and confirming that they were all thinking along the same lines as they were working to complete the project. I really liked this project and I would definitely assign this again. I was even tempted to have the students find the population numbers on their own, but the problem is that Wikipedia, Wolfram|Alpha, and other sources were not all matching in there definition of a ‘village’ and of the actual population (some sources are using 2010 Census data and some even earlier). Thus, giving the population numbers was definitely for my own sanity. 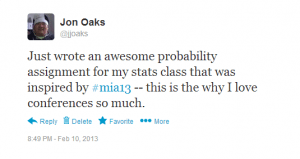 This entry was posted in Uncategorized and tagged Activity, Statistics, Twitter on February 20, 2013 by Jon Oaks.